Deltasone contains the active ingredient Prednisone. 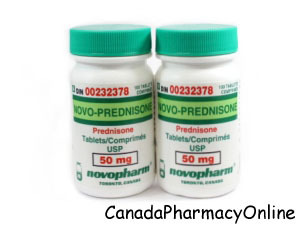 Prednisone is prescribed for a variety of different conditions including arthritis, lupus, psoriasis and other skin conditions, breathing disorders and allergies. It belongs to the group of drugs called corticosteroids. It is a type of anti-inflammatory drug which is used to treat inflammation symptoms in a range of different medical conditions. Deltasone is pregnancy category C and it is not known whether it may cause harm to an unborn baby. You must consult your doctor if you are pregnant, planning to conceive or breastfeeding. It is suitable for use in adults over 18 years of age. It may also be prescribed to children over 4 years of age for asthma.